When Malaysia scoured the region to study some of the sustainable and energy-efficient buildings around South-east Asia back in 2005, there was going to be only one outcome - 'a first'. It is the first building outside Singapore to obtain the island state's Green Mark platinum rating. Also, it is the first office building in Malaysia to obtain the Green Building Index, GBI platinum rating. Let's hope this will become a catalyst for other corporations and individuals to build more green buildings in the future. 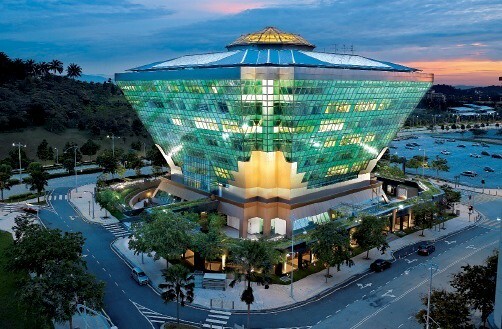 Energy Commission headquarters, the Diamond Building in Putrajaya was named the most energy-efficient building at the Asean Energy Awards (AEA) 2012 held on September 12, in Phnom Penh, Cambodia. The Diamond Building won the top prize in the category of “New and Existing Buildings”, which was open to buildings that were not more than 5 years old. The AEA, which began in 2000, is an annual awards programme that recognises “outstanding work for excellence, creativity, practicality and dedication to a cause in the field of energy”. The seven-storey Diamond Building is the first office building in Malaysia to obtain the Green Building Index platinum rating and the first building outside Singapore to obtain the island state's Green Mark platinum rating. Local firm NR Architect was involved in the design of the building, with Thai architect Dr Soontom Boonyatikam as the principal architect and IEN Consultants as the sustainability consultant. and RM45,000 from solar power generation. Reduced CO2 emissions : 1,400 tonnes per year, equivalent to taking 700 cars off the road. Building energy index : 65kWh/m2 per year (without solar PV), 56kWh/m2 per year (with PV). Solar PV cells installed : 71.4kWp, which yields about 1,400kWh/m2 a year. Lighting savings of 77% compared to the Green Mark base, but is expected to increase once task lights are distributed. The Green Mark base uses a reference building which is representative of buildings in the country. The eco-friendly measures cost RM3.4mil – about 6% of the total construction cost. The estimated payback period is 3.5 years. Source: IEN Consultants Sdn Bhd (The consultant for the Diamond Building) & The Star. It is really pretty, I believe the purpose of having it tilted structure is to give overshadowed sense for its surrounding hence decreasing the direct sunlights into the building. I wonder the concept of the building/structure and the relationship of the building to its site. "We are manufacturing Cheapest Price Of Solar Panel, Solar Inverter, And Solar Batteries. And Also have Available All complete Packages which include the LED Light - Charge Controller - Dc Home System. If you have interested in Solar panel: Solar System Packages"